Luca Curci talks with Gloria Keh during VISIONS of ANIMA MUNDI FESTIVAL in Venice. 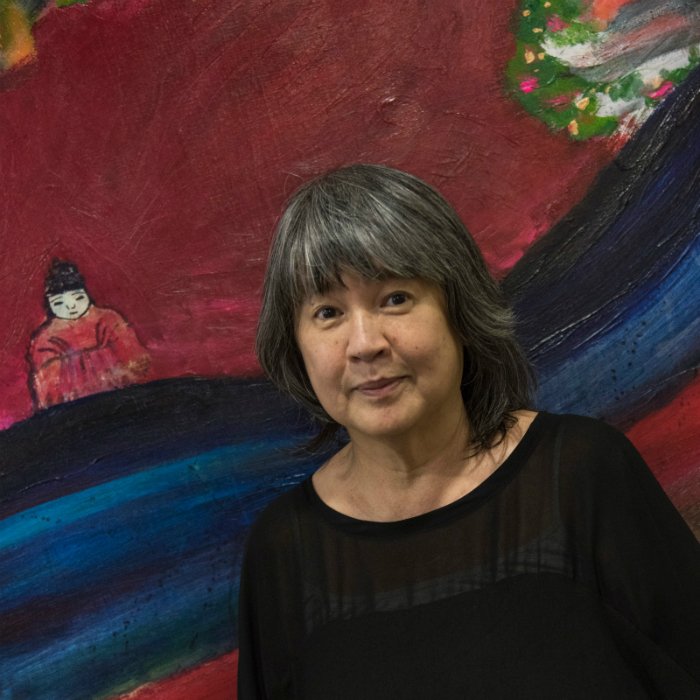 Gloria Keh was born in 1952 in Singapore. Her late father, the oil painter Martin Fu, a struggling artist, was her first teacher, introducing Gloria to the world of art, to European opera, and classical music. Her earliest memories are of sitting for hours, posing for his portrait paintings, mixing oil paints, and cleaning brushes. In 2008, Gloria founded Circles of Love, an art-based non-profit charity outreach programme, using her art in the service to humanity. 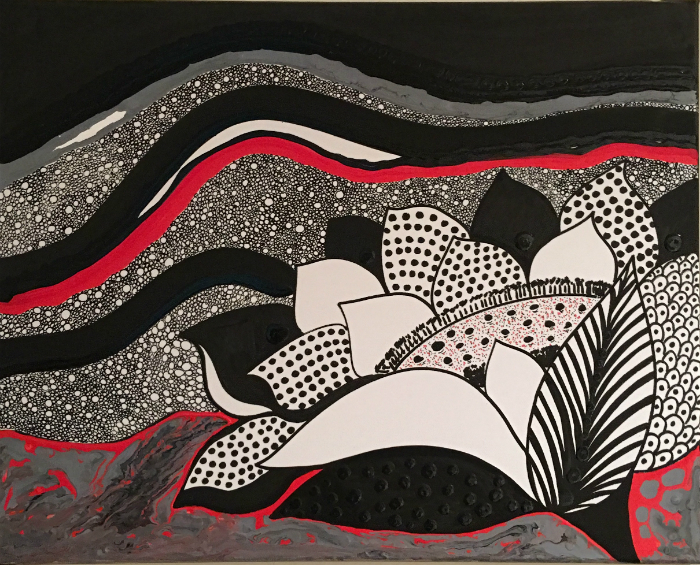 Facilitating workshops in Mandala art and symbolism, as well as in art journaling, Gloria is highly committed to fundraising through the sale of her art and services, to support charities both in Singapore as well as internationally. Her works have been acquired by collectors in Singapore, Malaysia, Indonesia, India, Sri Lanka, Australia, New Zealand, the United Kingdom, Switzerland, Italy, Russia, and the USA. And she has exhibited in group shows both locally in Singapore as well as internationally, in Malaysia, India, Australia, the USA, South Korea, Colombia, The Netherlands, and Italy. She held her first solo in Singapore in 2017, and her first overseas solo in Vienna, Austria in January 2018. A former magazine editor, and editorial consultant, Gloria won the prestigious American PATA Travel Writers Award for three consecutive years, for her self-illustrated travel stories. She has also self-published several art books. 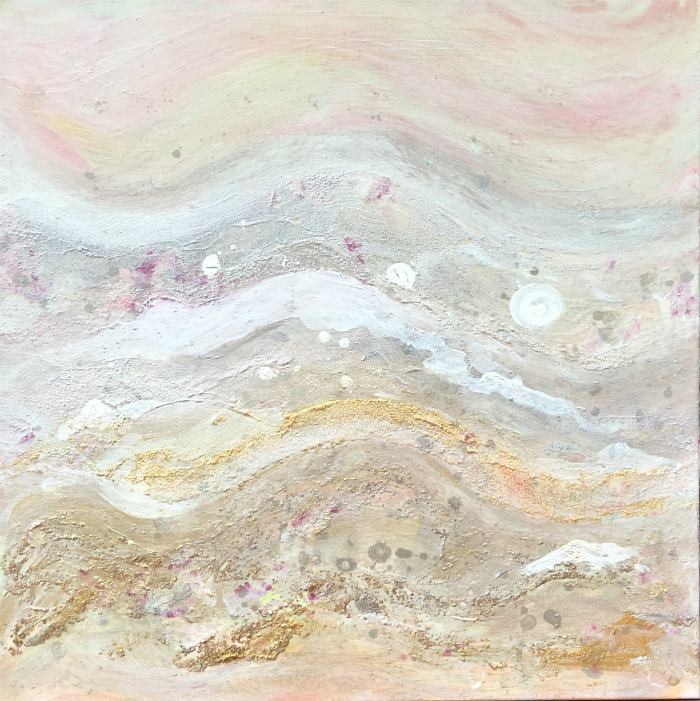 She is extremely passionate about raising funds for charities through her art, and considers painting to be a spiritual practice. “I find freedom, contentment and inner peace through my art. 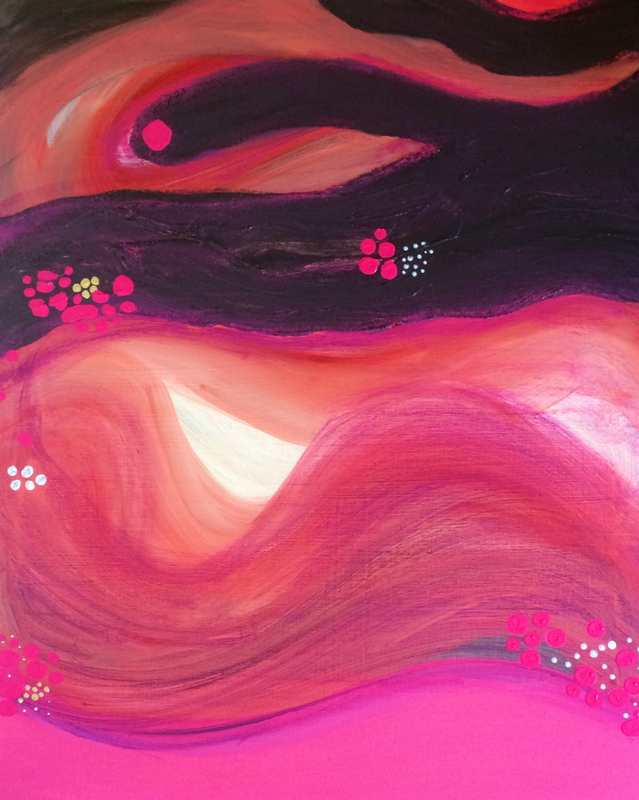 I enjoy the solitude art gives me, and am blessed with the gift of expression,” said Gloria. Luca Curci – What is the message linked to the artworks you have shown in this exhibition? How is it connected to the theme of the entire festival? this same energy as KI, synonymous with the energy used in the martial arts of Akido. Ruach, which means ‘the breath of God’ in the Hebrew, is yet another name for this life force, this Anima Mundi. 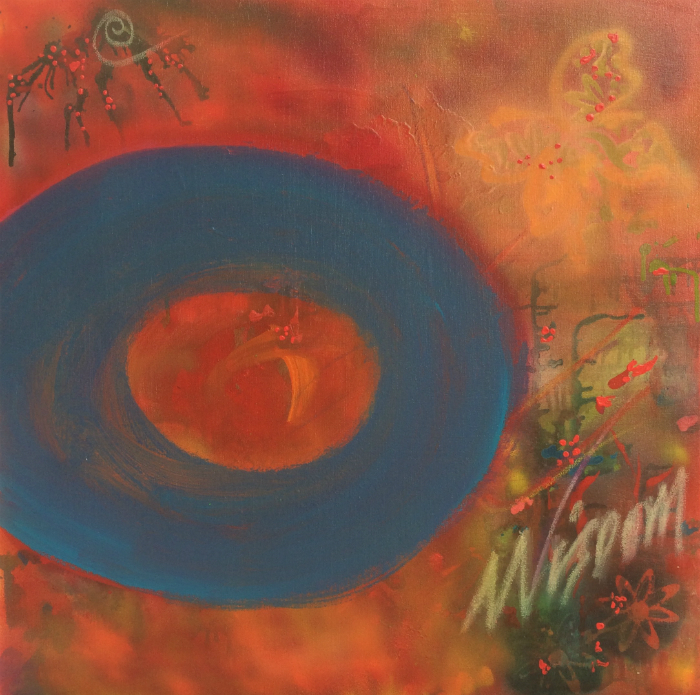 The blue circle in the work, is inspired by the Zen art of Zenga, and the making of the Enzo, which is a meditation practice, where in the circle is rendered in one single brushstroke and in one single breath. Traditionally, enzo is rendered using black ink, but I opted for blue, as blue is a color synonymous with healing, and healing is an energy that we and the planet need. Healing can only be possible with Anima Mundi. 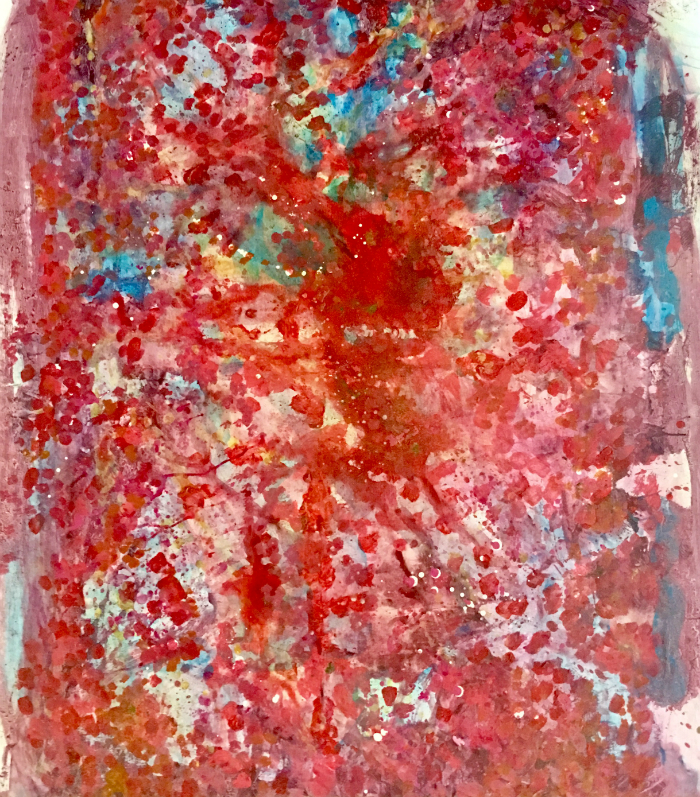 My second painting, Waves of At-onement, demonstrates that all of life is interconnected, and there’s this powerful energy, unseen by the human eye, that permeates through all of life, connecting all that there is. I envisage this energy, again depicted in the healing shades of blue, moving in a wavelike pattern, linking all of creation into One-ness. There is a play on the title of the work. To be at At-onement with all of creation, man must atone(at-one) for his misgivings. He must make right his wrong doings. Man must make peace with creation. With the Anima Mundi. This energy MUST be respected, for it is a powerful energy. A sacred Force. The third painting, The Birth of A Star, draws awareness to the fact that we are not just connected to things on this planet. But to all of the universe. To the planets of the galaxy and all the stars. I once read that we are star-ash. I cannot remember where I read this, but this line is stuck in my mind, and I resonate with it. The Birth of A Star expresses the birth of thought. An explosion of consciousness. This incredible flowering of intelligence is fired by the Anima Mundi. G.K. – More collages and larger works in the abstract, on canvas. Returning once again to inspirations drawn from the bounty of Mother Nature. But as a spiritual practice, and to ensure balance, I also paint regularly on smaller works on paper. I am particularly inspired by various forms of poetry including a Japanese style of poetry written in five lines, known as gogyoshi. Collaborating with a Japanese poet Taro Aizu; and Penelope Lee, a writer of blank verse. 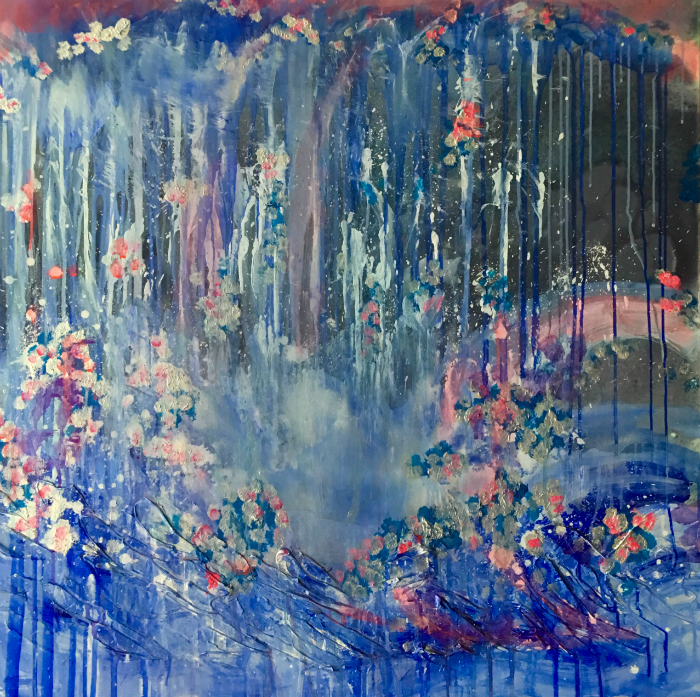 I also continue to collaborate with Chinese calligraphers, wherein the calligrapher writes a Chinese script of my choice over my abstracts depicting the mood and the emotions of that particular Chinese word. G.K. – I do work on series, e.g. my Lotus Series is an ongoing one, as the lotus blossom is my favourite flower. Similarly, I enjoy painting mountains, as well as monks, all in a contemporary vein. In the abstract, I always want to add more waves paintings to my Wave Series. I find the movements in making waves in art, most satisfying, as it gives me great freedom in brushstrokes and overall expression. So, I would say, yes, most of my works do focus on specific themes. But every now and again, I have this penchant to paint something not planned. Sometimes, the idea would be whacky. Pure fun. An idea would suddenly pop up in my head, and I just have to express it on canvas. G.K. – As challenging as always, with the types of challenges changing with the passage of time. But highly rewarding. Just being able to be part of the creative process is reward enough for me. 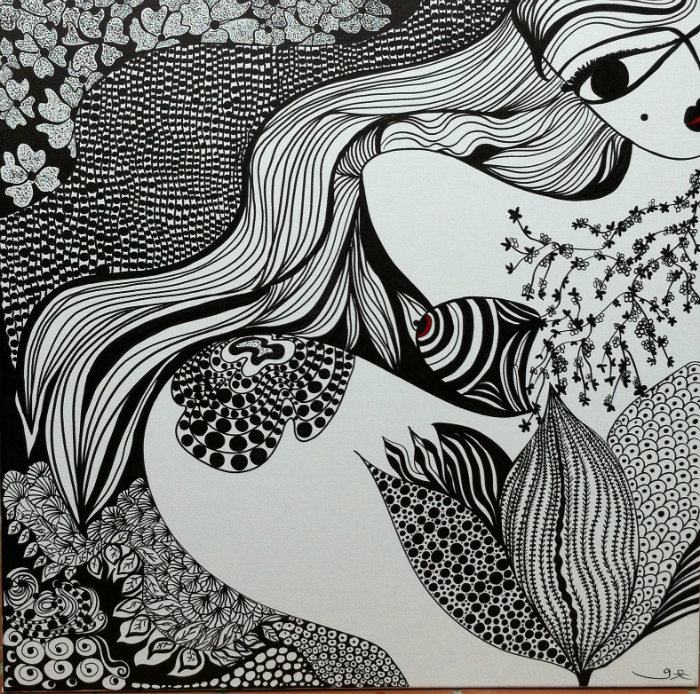 I sell my art only for charity, to support various charities, both in Singapore, where I live, as well as internationally. I will be 66 in March 2018, and have been painting since I was a child. My late father was an oil painter. So I cannot imagine a life without art. I grew up with the smell of turpentine. Art is my Anima Mundi. G.K. – This is such an interesting question for me. I am very curious and constantly like to try new techniques, new materials. Attempting new things can pose a challenge or two, but at the same time, I am rewarded with the satisfaction that I could do what I had set out to do. Although this may be a challenge, it is also healing for me. I find one-ness when I am in communion with my art. Right now, the main consideration is my health and physical limitations. For example, that I am unable to paint for as long a duration as before. This can be frustrating at times. But it has also taught me acceptance and patience. Of course, I wish I had more physical strength to paint for longer hours. But that is life, and one has to accept the things one is unable to change. I paint every day, whether on small canvases in the backyard of my home, in my art journals tucked up in my little study, or on large canvases in my studio. To be able to engage in art daily, is to me, a huge blessing. 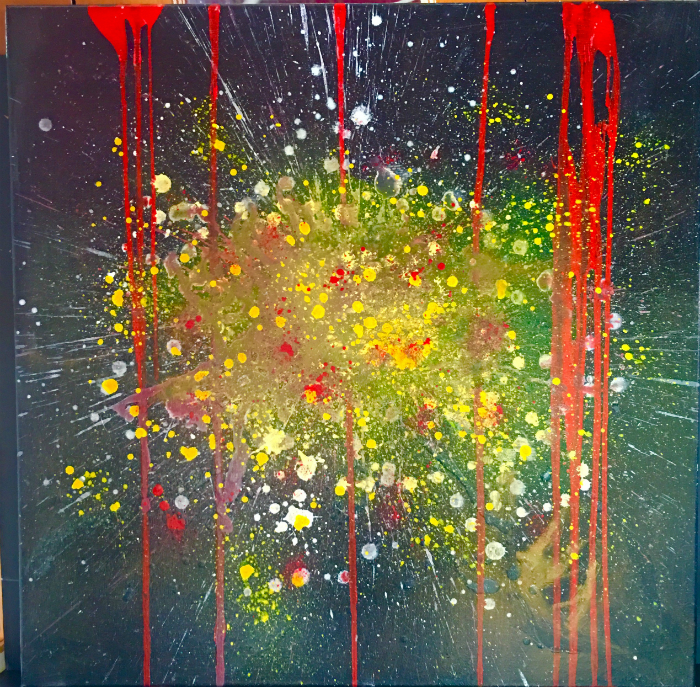 G.K. – I love painting abstracts on large canvases. Often, I am told to paint smaller works, that are not only more affordable, but most of all, easier to be displayed in homes. In Singapore, a small island, most of the population live in apartments. Land is scarce. Wall space is a major consideration for many potential buyers. Indeed, an artist can always learn from the comments of others. Sometimes, many of us artists can be divorced from practicalities. Feedback, taken with a pinch of salt, can be constructive. But the artist must have an open mind and learn to envisage art from the standpoint of another person. L.C. – Do you think It’s Liquid Group can represent an opportunity for artists? G.K. – I believe so. I am very pleased with the It’s Liquid Group. I appreciate the themes of the Group’s exhibitions, and the historical settings selected for housing the exhibitions. Am certain many artists will welcome the opportunity to be able to showcase their works in such beautiful and prestigious surrounds. L.C. – Would you suggest cooperating with us? What do you think about our services? G.K. – I will, and actually already have recommended It’s Liquid Group to other artists. I find your support services excellent. Was very impressed with the catalogue for Anima Mundi too. However, I have a pointer that I would like to offer for your consideration: I feel that the problem for artists, like me, living so far away from Italy, lies in the courier/freight charges of sending works to Italy, and then bringing the works back to our home countries. From my experience, forwarding paintings in stretched form, has proved very costly. Undoubtedly, this can pose a deterrent in future participation. If only a service could be offered for overseas artists, wherein our paintings can be sent to Italy in loose canvas form, rolled up in a tube, and if the Group could arrange for stretching in Italy, at a reasonable cost. Then, after the exhibition, the paintings should be unstretched, and returned to its country of origin in loose canvas form. This will definitely save a lot in freight costs, and will be an added incentive for artists to repeatedly participate in more of your Group’s exhibitions.